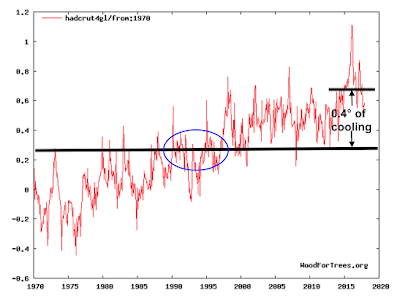 MSE Creative Consulting Blog: Global Cooling: How Much Might There Be? There has been a lot of talk (here, and elsewhere) about a new paper that posits that the lack of sunspots (I won't go into the technicalities) will cause "several tenths of degrees" of global cooling. But, none of these, to my knowledge, is plotting out what this might mean. So, we are going to go boldly where no one else has gone and plot this out. The dictionary says several means, "more than two or three but not many." So, to be conservative, lets say several means "four." Here is the latest temperature data (HADCRUT4). I've averaged recent temperatures out a bit and have depicted 0.4°C of cooling with the long black line. 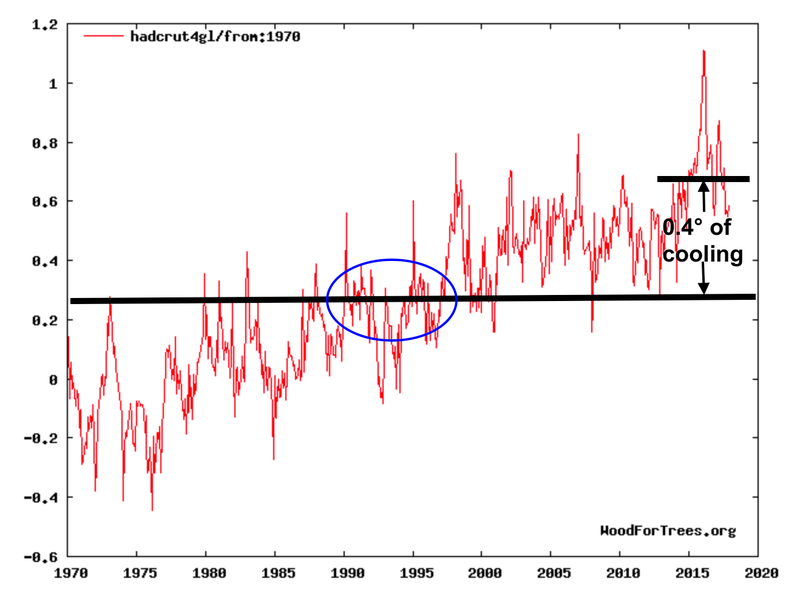 Essentially, the 0.4°C of cooling would do is take us back to the early to mid-1990's in terms of earth's temperatures if one assumes no other changes in earth's temperatures over the next couple of decades. That remains to be seen. Some believe the 2000-2014 "pause" in global warming will resume, others do not. It is also possible that "several" will turn out to be greater cooling than four-tenths of a degree. It will be interesting to see how all of this plays out over the next decade or so.